Union Aerotex Textile Ink is a water-based ink that, when mixed with the included catalyst, cures at room temperature to obtain optimum wash resistance just 24 hours after printing! Aerotex inks are great for use on T-shirts and other fashion garments.They are formulated for printing on cotton, cotton/synthetic blends, and many synthetic fabrics. Aerotex Inks are not recommended for nylon or fabrics which are treated with water-repellent coatings. 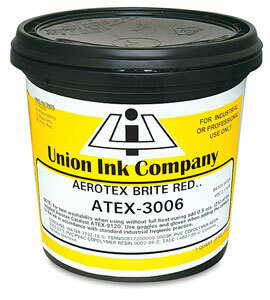 Aerotex inks have good opacity and may be printed on medium-colored grounds. White may be printed as a separate color or may be added to Aerotex colors for increased opacity and overlays. Aerotex inks are supplied ready-for-use. They can be thinned using Union Reducer/Retarder, or extended using the Union Extender Base. Monofilament polyester meshes ranging from 84T-110T are recommended. Aerotex Inks are supplied with the correct amount of catalyst for quart and gallon containers. It is essential that catalyst be added to obtain wash-fastness, regardless of whether the prints are air-dried or conveyor-dried. The ink/catalyst mixture has a normal shelf life of 48 hours, and should not be used after that time. Under certain conditions the ink/catalyst mixture may show signs of deterioration before the 48-hour time period has elapsed, in which case it should be discarded. Shimmer Colors — Combining the sparkling brilliance of plastisol and the soft hand of waterbased inks, Aerotex Shimmer Colors are a natural for white and light-colored fashion garments. Catalyst — For Aerotex Shimmer Inks, a 2% by weight amount of Catalyst is required for wash-fastness. The ink/catalyst mixture has an appropriate pot life of eight hours. For extended open screen times, 2–5% of Reducer/Retarder may be added as necessary. ™ Union is a trademark.